Last week The Good Place ended with our four humans discovering Michael and Janet about to go through the door to the afterlife. Immediately picking up from that moment, the Brainy Bunch demands to know what that door was, and what the Good Place is after apparently overhearing it from Michael and Janet’s talk. After a feeble attempt to withhold the truth, Michael reveals everything, and I do mean everything, to the four humans. Michael reveals that all 800+ attempts to torture the group lasted around 300 human years. When Chidi presses on how that’s possible given they’re in the year 2018, Michael answers his, and many viewers’, question with two words: Jeremy Bearimy. What this means is that time isn’t linear in the afterlife, it loops and twists and somehow resembles “Jeremy Bearimy” in cursive English. Chidi notices that Michael dotted his “i” and immediately is curious about it. Michael and Janet explain that it is simultaneously Tuesday, July, and never. Chidi hears this, and then his brain breaks. From there our characters split up, forming four different mini plots. After hearing of their fates, Tahani realizes why she ended up in the Bad Place and aims to be more genuinely altruistic. She recruits Jason as her bodyguard and donates 2 million pounds to the Sydney Opera House anonymously, and the two then walk the streets literally giving random strangers large sums of money. Jason reveals his own poverty in Jacksonville, and Tahani wishes to give him money from her bank account, although Jason is willing to have it all go on a Gamestop gift card. The bank employee refuses, stating that Jason isn’t responsible or mature enough, and that the bank doesn’t even allow people from Florida in the building. Eleanor heads to a bar and demands a free drink because of the bar’s policy of a free drink on one’s birthday. Even when revealing she’s lying, she still demands the free drink. The bartender does so, but later lectures Eleanor on why rules exist and how society would suffer without them. Eleanor agrees but prefers a lack of rules because she’s American and that’s how Americans live their lives, looking out for themselves. She isn’t entirely wrong about that. She finds a wallet on the floor and struggles with taking the money. She resists and returns the wallet, along with various things from the owner’s previous residence. The owner of the wallet reveals a picture his daughter drew for luck at his new job, driving Eleanor to tears. As mentioned above, Chidi’s brain breaks and it is strangely hilarious to witness. He walks through sprinklers, pauses, and then just takes his shirt(s) off leaving them on the grass. This is clearly to show Chidi’s state of mind, and isn’t done for any shallow reason whatsoever. Reminiscent to Eleanor in the season one finale, right before she died the first time, Chidi shops at a grocery store, filling his cart with all sorts of food, and a tight purple shirt (again, clearly no shallow reasoning here). At the checkout he gives his credit card and car keys to the cashier. 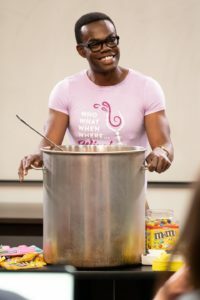 Chidi uses the food to make some kind of chili in a huge pot, while he adds candy as a special topping. This is happening when he’s supposed to be teaching his class. The students are concerned of an upcoming final and push for some new knowledge for the test. Chidi brings up the 3 main branches of ethics: Deontology, Virtue Ethics, and Consequentalism, all of which tie in with Tahani & Jason and Eleanor’s mini plots. After some rambling of how the students may fail, but pass or how they’ll get an “F” but also an “A” at the same time, and how the aforementioned three branches are garbage and Nihilism is the way to go, the students are dismissed. Eleanor has snuck into his class and helps him out of his funk. While all this is happening, Michael and Janet type a manifesto of all they’ve learned, and how the system of who goes into the Good Place can be changed, hoping it works even if they’re both retired. The humans enter and bring forth new revelations. Jason and Tahani got married, to Janet’s horror, so they can share the money legally, while Eleanor proposes that all six of them be good people to everyone and help them get into the Good Place. There’s an acknowledgment that it’s all they can do since they’re all doomed to a sad fate. Thus the Soul Squad was born. Larry Hemsworth enters and asks if Tahani’s ready for their flight. That poor guy. Ok, wow. That was an insanely long recap, but SO MUCH HAPPENED this week. First Chidi, and by proxy William Jackson Harper, stole this episode. Chidi’s meltdown was simultaneously hilarious and sad. A man who earns a living teaching ethics just found out that it was all for nothing. It’s quite sad and makes one, or me at least, sympathetic to Chidi’s plight. Tahani and Jason getting married was shocking, and I hope there’s not some retread of season 2’s love triangle of those two and Janet. Eleanor showed real growth giving all those things back to wallet guy, and being moved to tears at the (untalented as per Eleanor) daughter’s drawing. The end of the episode seemed to be where the show was heading all this time – that humans are meant to be altruistic without any need for retribution or recognition. That’s it. While the other parts of the episode were entertaining and funny, the meltdown was just on another level. Chidi definitely stole the title of “most distracting” from Jason this week. On multiple levels. None of which are shallow ones, of course, nu-uh. I don’t think that Tahani and Jason’s marriage is meant to be a love triangle this time. I think it’s meant to be another hilarious snag, but there don’t seem to be any actual romantic feelings between them this time around (as opposed to the previous time). Although, I actually ship them more than I did last season when it was romantic. Perhaps because they’re not developing it that way I enjoy it more, I don’t know. I still adore Janet/Jason, though. And lol yes, poor Larry Hemsworth. That guy can’t catch a break.